“The Incident” is of course a reference to The Battle of New York featured in The Avengers. This is much more than a mere reference; but is actually a driving force in most of this shows plot – but I’ll discuss that more in depth in a later article. Owlsley says “Heroes and their consequences are why we have our current opportunities.” Considering Daredevil takes place before Avengers 2: Age of Ultron, that makes this show still Phase 2 in a sense; and the theme of Phase 2 is all about “Heroes and their consequences”. The comic book version of Father Lantom also has connections to Cloak and Dagger – two other NYC-based heroes that would fit in quite well here. Wesley’s comic counterpart was also a Kingpin henchmen; but here there is much more prestige and friendship between them. The ‘Mr Rigoletto’ mentioned here is most likely Don Rigoletto, the Kingpin’s predecessor in the comics – we’ll address him further in Episode 8. At the time this was being filmed, there were major concerns about NSA wiretappings and a possible reemergence of measles in NYC. Both are mentioned in this episode. 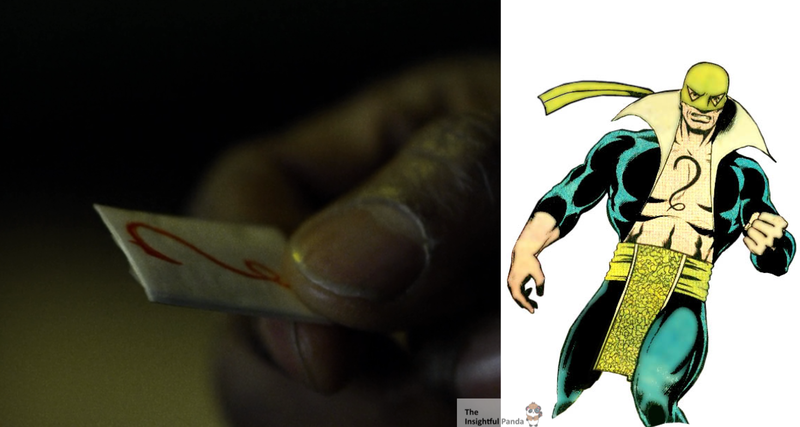 Total coincidence probably, but I couldn’t help but think of Hydra’s famous ‘cut off one head, two more will take it place’ chant when Fisk’s man told Daredevil if he killed him someone else would “take his place”. In the comics, Ben Urich worked for the Daily Bugle and played a part in many famous story lines. Though since this was all filmed pre Marvel/Sony deal, they had to change his place of employment to something not Spider-Man related. Don’t worry. Fisk is going to get that date with Vanessa. In fact, she’s the future Mrs Vanessa Fisk of the comics. Urich’s quick comment about looking into Karen’s ‘dark past’ is the first hint at Karen not being as innocent as Matt first thought. More on this later; but if you want, check out the ‘Born Again’ story of Daredevil – one of the greatest daredevil comics of all time. Spoiler Alert: It’ll ruin your opinion of a certain character. 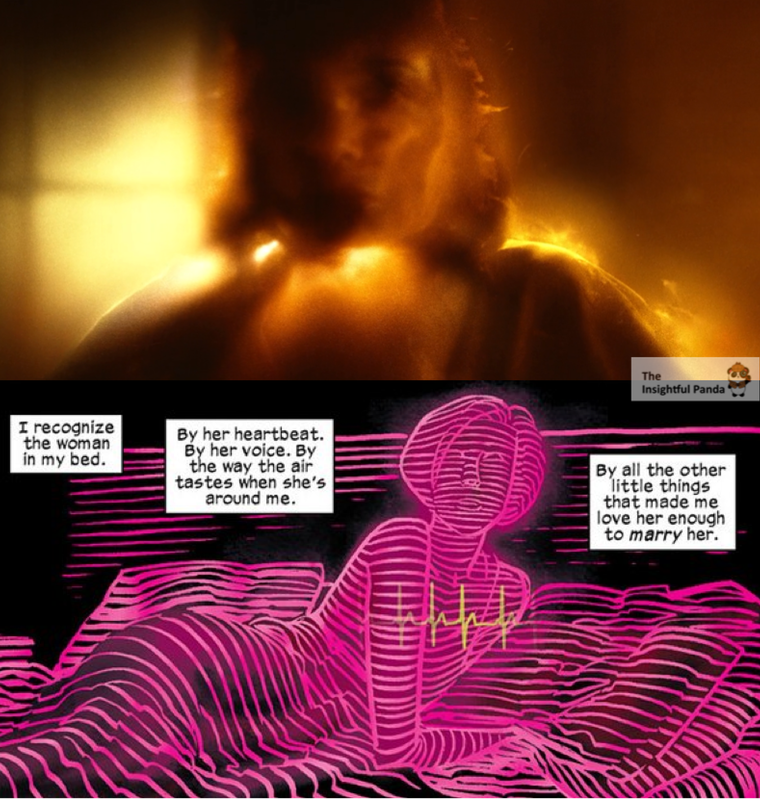 This explanation of ‘a world on fire’ is the closest thing we’ll see to a ‘Radar Sense’ form the comics. How is Karen so fluent in Spanish? Could it be part of her ‘dark past? Fun Fact: It is. St Agnes Orphanage (where Murdock is left as a child) is most likely the same St Agnes where it’s revealed that Skye from Agents of S.H.I.E.L.D. was left. The man Stick is talking to at the end is most likely Stone, a former/ favorite pupil of his and as you can imagine, he’s quite invulnerable. Though this time around it seems Stone is the master and Stick is taking the orders. Kingpin’s predecessor Mr Rigoletto is mentioned in Fisk’s flashback as the man his father owed money to. Fun Fact: In the comics, Rigoletto is murdered by his body guard, who was none other than Wilson Fisk himself. Based on this past history, it’s safe to assume Rigoletto suffered a similar fate in this universe and DIDN’T “retire to Florida” as many suppose. While in Mr Potter’s shop, we see a poster on the back wall called “Revenge of the Gladiators”, subtle allusion to his comic alter ego “Gladiator”. Additionally as commenter Zauriel pointed out, in the same scene where we see the “Revenge of the Gladiators” poster, we also see a bunch of buzz saw blades lined up on the bottom left. Why does a tailor need so many large buzz-saws? Well this is actually another reference to his “Gladiator Alter Ego”, who used saws as his primary weapon. But keep an eye out, because this won’t be the only time we see Mr Potter using saws. “Yah I could say I’m Captain America, but that doesn’t put wings on my head” No it doesn’t Foggy. 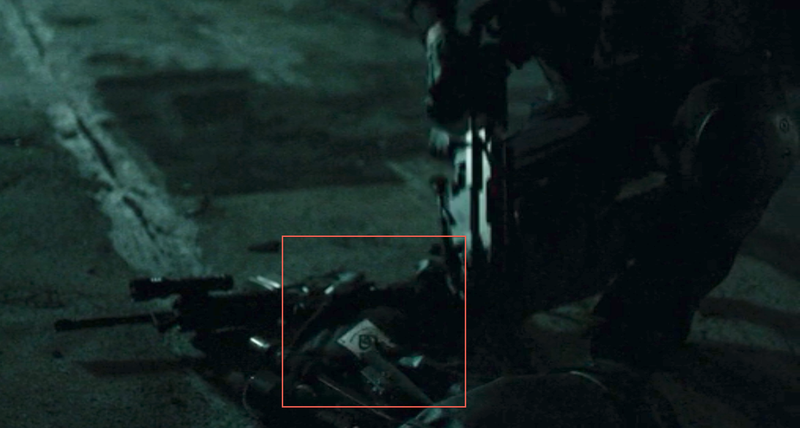 The logo on the Heroine packets is the same as Steel Serpent (aka Davos), who is a major enemy of Iron Fist – another upcoming Netflix series. Purposeful or not – we’ll see in Season 2 – but the ‘Greek Girl’ Foggy mentions during their College days just screams Elektra. 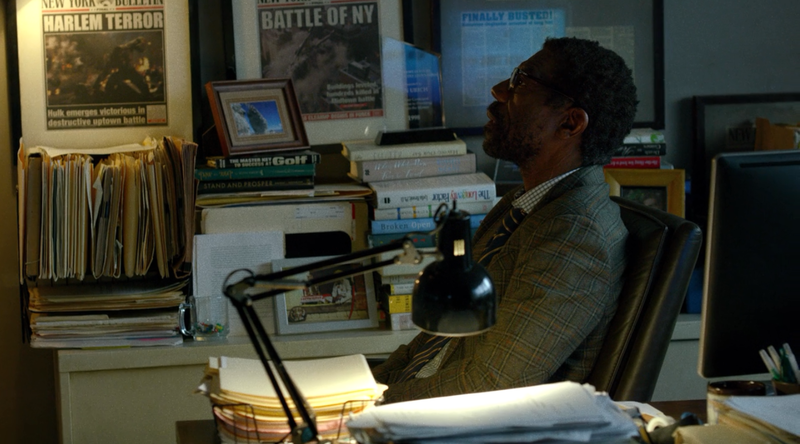 The framed articles in Ben’s office are Battle of New York – again, The Avengers – and Terror in Harlem. This is a direct reference to The Incredible Hulk film, which IS cannon despite the role of Banner changing. In the early stages of their comic relationship, it was Fisk who had a near death experience – not Vanessa – although later on Vanessa did end up in a catatonic state for a while. While Daredevil is inspecting Mr (Melvin) Potter’s workshop, he passes by a strange diamond design. This is a reference to ‘Gladiator’s chest symbol. Overall, Potter follows his comic story quite nicely as after the fight with Daredevil reveals that Fisk is holding someone named ‘Betsy’ hostage, and agrees to help Daredevil if he can save Betsy. The Betsy Potter is worried about/in love with is Betsy Beatty and is someone who helped him rehabilitate from his former criminal life in the comics and whom he later married. Remember Karen’s comment about giving up drinking and moving onto the hard stuff? Well be careful what you wish for. By now you can recognize the hints at Karen’s ‘dark past’; as well as the hints about her dark future. Here Vanessa is much more supportive of Fisk’s criminal activities than she is in the comics; but their love is just as strong as the comics. At one point in the comics, he even gives up crime for her! Ben Urich is brilliant and in the comics deduced that Matt was Daredevil. Here we see hints that he already figured it out. Ie: ‘sounds like a boxer’, nobody would look at a blind man twice. We get confirmation that the heroine with the Davos/Steel Serpent symbol on it is indeed called ‘Steel Serpent’. The enigmatic Madame Gao has been shown to speak ALL languages and fend off Daredevil with one palm strike. Could her homeland that is a ‘considerable distance farther’ than China be the mythical land of K’un L’un or one of the other Heavenly Realms – another Iron Fist reference. Considering her heroine is also an Iron Fist reference, it’s quite possible. Though I’ll go into more detail about Gao’s possible identity in the Season 2 Predictions article. We’ve seen Kingpin’s ‘invulnerability’ played out in his suits, but his pure physical bulk being an asset has only shown up offensively. 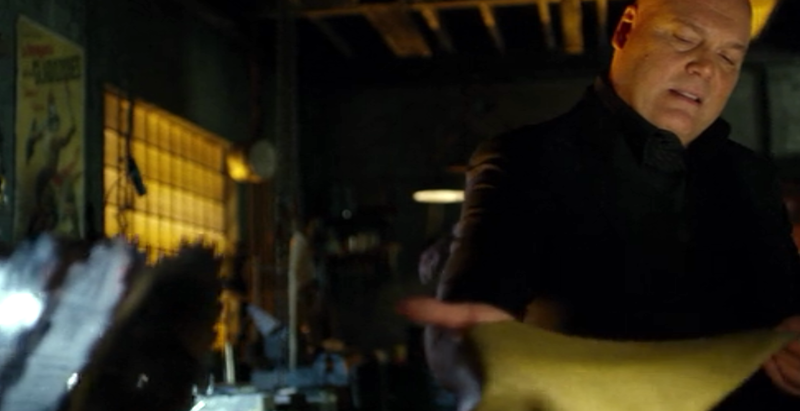 Here we see it defensively when he withstands a taser to the head – the same taser that knocked the wind out of Daredevil when pressed against his chest. We hear a reference to the 1970s film ‘Serpico’, which was based on a cop who called out police corruption. Interestingly enough, Showrunner Steven DeKnight spoke about wanting to adapt Punisher at some point. I bring this all up because the Ultimate version of Punisher didn’t loose his family by a mob killing but rather as retribution for exposing corrupt NYPD cops who had in the employ of Owlsley. Seriously, this writes itself! Right before Potter shows Daredevil the new costume, you can see plans on the table for Gladiator’s famous buzz saw arms. BONUS: Stan Lee Cameo It’s not a Marvel product without a Stan Lee cameo, and Daredevil waited for the last episode to throw it in. 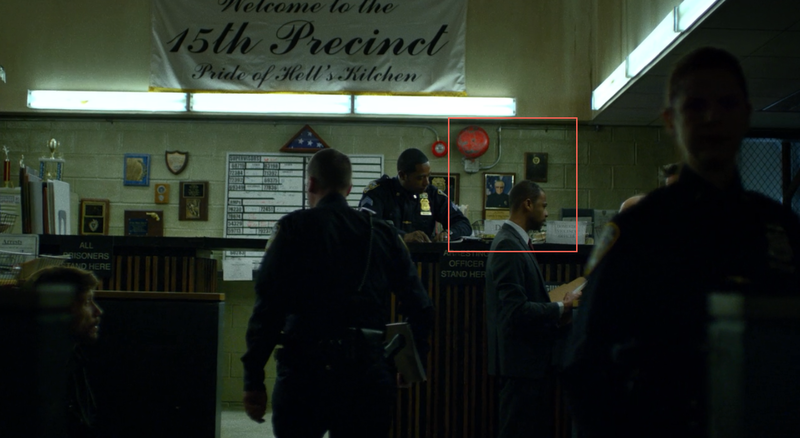 Whereas Stan Lee didn’t cameo live, a photo of him as an honored cop can be seen hanging in the Police Station during Episode 13 “Daredevil”. Well there you have it, over 50 different Easter Eggs from Marvel’s Daredevil Season 1. There’s only so much you can do with the patented Marvel method of ‘They mentioned an obscure name/place, I should research that name in the Marvel Database”. So if you found something that I missed, please let me know and I’ll add it to the list and credit you. I hope you enjoyed this Easter Egg List. If you want a Closer Look at this Season as well as what to expect from Iron Fist, The Defenders and Season Two, check out my article on that. Otherwise, stayed tuned here and follow me on Facebook for the latest! Wow – binge watched Daredevil Season 1 Sat and Sun…caught some of those EEs, but missed many due to a pretty shallow knowledge of MCU. Watching out for them will make watching the episodes again entertaining. Look forward to more insight! Much appreciated. 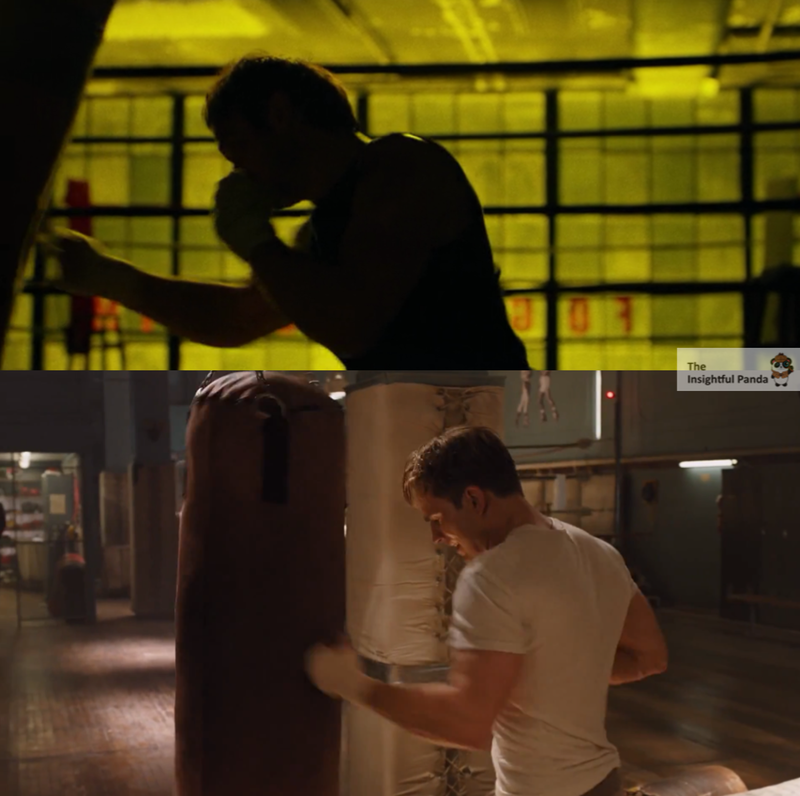 The light on the helmet of daredevil is a reference of the first yellow Costume of the comics. In the first episode, the prison guard approached by Wesley (and who later tries to kill Karen) is named Mr. Farnum. Frank Farnum was Nelson & Murdock’s first landlord, and also a villain who went by the name of the Masked Marauder. I may have caught one that everyone seems to have missed, at least I can’t find any other reference online. In the garage scene where Fisk/Kingpin is confronted by Leeland Owlsley about his embezzling (right before he’s killed) the building outside of the garage door sure resembles an OWL; including wings and glowing eyes! Maybe the Owl will be making an appearance next season after all? Well Leeland was the Owl in the comics if i remember correctly, so maybe it was just a reference to that. I’ll have to rematch the scene. But… wait a second. Didn’t he mention ‘a son’? Ohhhhhh, perhaps he’ll become the Owl at least for a brief moment. If this is true, then great catch! Madame Gao is less likely to be a citizen of K’un L’un than one of the other Seven Kingdoms, particularly Ku’n-Zi. Mhmm, sorry I never put the link. But in my Season 2/Defenders/Iron Fist Set Ups article I go into how she is most likely Crane Mother. So yes, you are right! I noticed two things that aren’t on the list. I’ve never read the comics, and am new to Daredevil. Matt and Foggy’s new office has a worn, art deco style name on the glass . You can see it in reverse, under the sign they taped over it, when they are in the office. I tried to search back through to double check, but if course can’t find when I saw it. I’m pretty positive it says Van Lunt Real Estate. Clue? One of the early episodes, they go to the M Tuths Wing, which is on a blue banner over the hallway, the camera pauses for a second so you can catch it. Michael Tuths is a clearance coordinator on the show. I have NO idea what that’s about! I think it’s in Episode 8 i don’t remember for sure: while at melvin’s workshop, the panning shot that introduces us to the place, first gives us a glance of all the buzzsaws, aligned in the front table…. I think that’s also a reference for gladiator. Oooh, nice! I immediately saw the designed ones in 13, but yes. Those saws are definitely a Gladiator reference! Nice eye! About the use of “Nessun Dorma”- it’s the most famous aria in the Puccini opera “Turandot.” In the story, the haughty Princess Turandot has agreed to marry only the man who can solve her riddles, but then reneges when the protagonist actually does so. He tells her she has a single night to guess his name- if she can’t get it by dawn, they’ll be married. Seems like a pretty solid choice considering so many of Matt’s storylines revolve around his successful concealment of the Daredevil identity. Beautifully put! And yes, The whole season didn’t only deal with keeping people from discovering who the Daredevil was; but also with him ‘unraveling’ Fisk’s convoluted and intricate network of plans/accomplices. Quite the perfect choice indeed! No, sorry, I have to agree with Jillian. I just watched it again, and he clearly says “stark” – as in bare. I don’t believe it’s a reference to Tony, however.